An unbearably cold day was spent at home. The gray, droopy skies added to the gloom and we were cooped up when it was supposed to be a day spent out. I started getting a bit impatient late in the evening and so did the girls. Some activity and a warm oven was needed bring the cheer in my home. We quickly decided on baking to calm us down. I am not exactly sure why I thought of a jam cake. I wasn’t even sure if it was a conceivable idea. But a quick search brought up a few recipes and I settled for Heidi’s, for her recipes are undoubtedly the reliable ones. The recipe was not elaborate and was well tuned to bake with 2 pairs of extra, but little hands. Overall, it seemed just right for that evening. I agree the cake is not good looking one. I am sorry for the crappy photographs. I barely got a couple of minutes before the cake was “attacked”. Besides my photographs at night are beyond frustrating. I skipped the icing, and did not bake in a pretty bundt pan, both of which would have made it look good. But what the heck! Does it matter? The other changes rolled into reducing sugar, substituting part of the AP flour with nut flour, using yogurt instead of cream and using oil instead of butter. 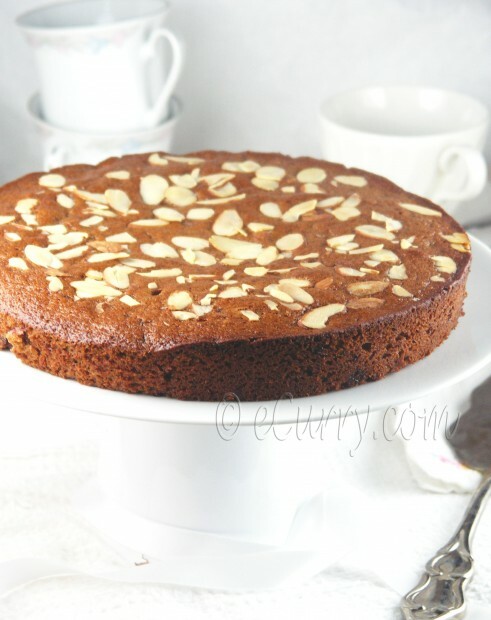 It tasted great; incredibly moist with the fragrance of the spices filling in the home and the the cake had a strong underlying taste of preserved fruit and nuts. Preheat oven to 350. Butter a 7-inch tube or round cake pan or bundt pan. Sift together flour, baking powder, baking soda, cloves, cinnamon, and nutmeg. Add the nut flour and gently stir it in. Whisk butter/oil and brown sugar until light. Beat in eggs, one at a time. Beat in yogurt. Stir the flour mixture into the butter mixture until barely blended. Stir in jam/preserve and nuts. Pour into greased and floured pan. Generously sprinkle the almond flakes on the cake. Bake until done, about 30 minutes. Cool, turn it over and cool completely before slicing. If you can, let the cake mature for at least a day before you eat it. The spices sets in and infuses as it gets older and tastes way better than just baked. Quick, easy and loved by all! The cake and the pictures are pretty Soma you are so modest. Agree with the cold, some days are really unbearable (but I am glad we are not up North). Would love to have this with a cp of tea that I am having now. Hope you are all doing good. It looks moist and delicious. I often bake cakes with yogurt. I like the texture it gives to cakes. A delicious looking cake! I love that addition of yogurt. The cake is interesting in it’s ingredients. They look rich and decadent. I love nuts, I love fruits and this cake has it all! Aaahh…..anything you make looks so special. Can’t believe you took those photos at night! What lights do you use….? They look great as usual. I’m having a love affair with nuts at the moment so this is right up my alley. Will be posting a pistachio and choc cake soon! I do like using nut flour in my baking. They are healthy and I love the texture and the flavor better than ap flour. Pistachio and Choc sounds divine. Will be impatiently waiting for your post. rich and moist looks yum,. I wonder how the cake would taste. That is pretty moist and delicious! 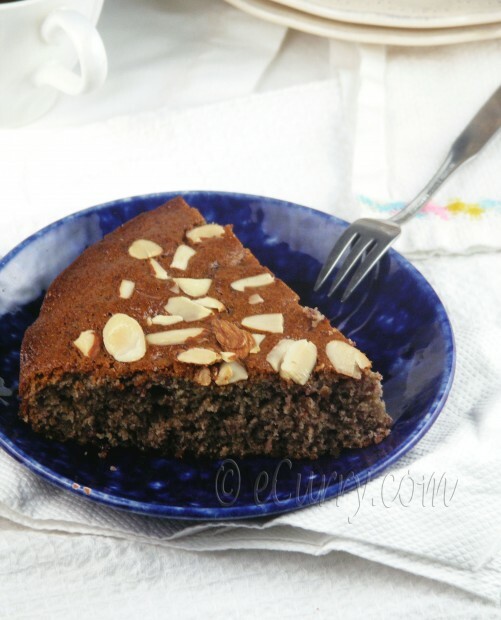 Love the nutty cake, looks just right for a quick dessert for my family. I can only imagine how moist this cake must be with the almond flour, oil and jam in the batter. And so simple to make too! sounds absolutely delicious and looks great too! I love nuts in desserts and specially in cake, so this is just the thing I wanted 🙂 I’m checking out your Ego light….are you happy with it? Mmm the sound of this alone is enough to make my mouth water. Like the almonds on top as well. A nice cake to enjoy with tea, I’m sure. Oh how lovely! and I love the spices you’ve added into the cake! I must try this one day! Thanks for sharing! I am planning on making this cake today. But having a tough time finding almond flour. Guess Ill stick with AP flour. Did you find almond flour in the baking aisles itself? I buy almond flour from whole food market. If you do not find it in the stores, just grind up blanched (its ok even it if it is not blanched – sometimes I grind up whole raw almonds, skin and all) almonds with a tablespoon of sugar (the sugar kind of soaks up the oil) at home!! Even if it not that find it is oka, the only thing is you might feel the coarse nuts – which in my home is not an issue! Still looks pretty good to me! 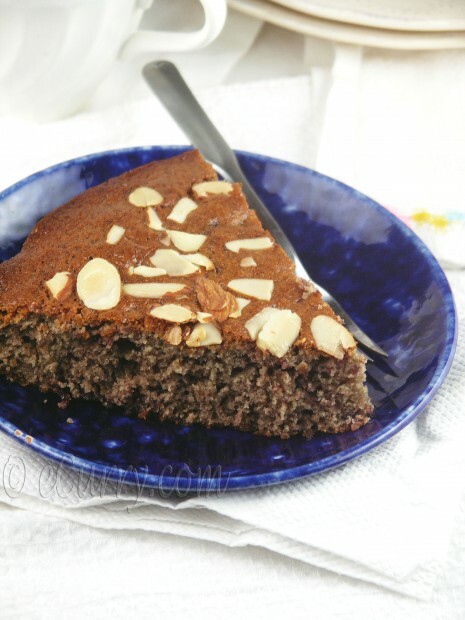 Soma – I ultimately found Almond flour in my local grocery shop and made this cake immediately at home. It is mind-blowing tasty!!! 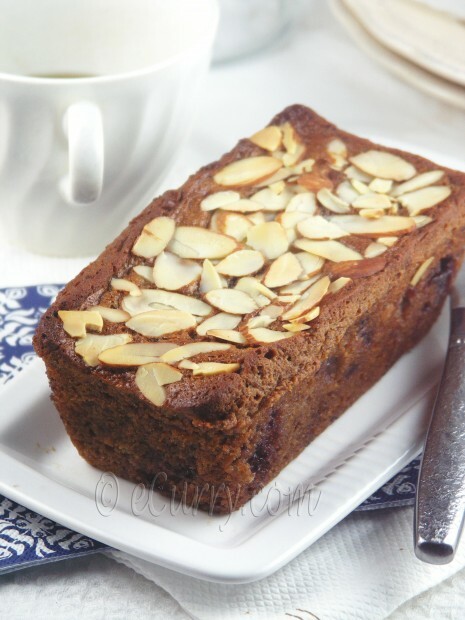 The combination of almond,jam and spices is awesome. I will be making this cake again for the super bowl weekend for friends. Thanks for this recipe. Thanks for letting me know. And it is indeed a quick and easy delight.